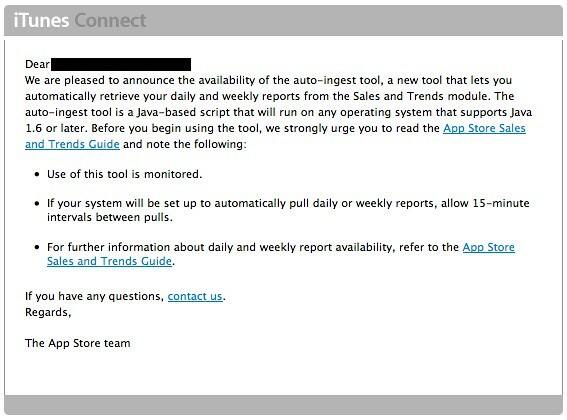 Apple sent out an email to devs earlier today announcing a new tool available via developer.apple.com that will allow you to “retrieve your daily and weekly reports” from the iTunes Connect Sales and Trends module. The Java-based script runs on all operating systems running Java 1.6 and up. As new reports become available we will modify and redeliver the java package or new parameters to use to download new products (i.e. we will modify the script for new features). We will communicate both the anticipated date of the report release and the date that the tool will be able to retrieve reports. You can review instructions on how to use the new tool in the iTunes Connect Sales and Trends guide. Full contents of Apple’s email below, if you’re interested. We are pleased to announce the availability of the auto-ingest tool, a new tool that lets you automatically retrieve your daily and weekly reports from the Sales and Trends module. The auto-ingest tool is a Java-based script that will run on any operating system that supports Java 1.6 or later. Before you begin using the tool, we strongly urge you to read the App Store Sales and Trends Guide and note the following: – Use of this tool is monitored. – If your system will be set up to automatically pull daily or weekly reports, allow 15-minute intervals between pulls.